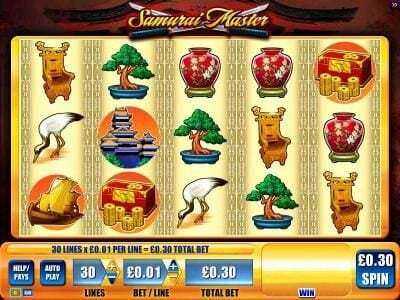 Samurai Master online slot machine pictures and slot feature list from WMS, play Samurai Master Slots for free. 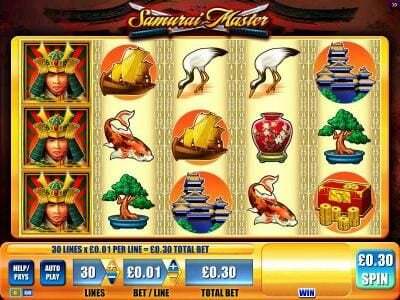 Samurai Master Slots has not been reviewed yet, be the first to rate this slot. 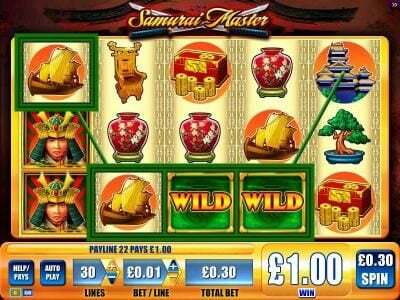 Samurai Master is a Slot found under the wms software. It has 5 reels, 30 paylines and offers $2,500 worth of prizes. 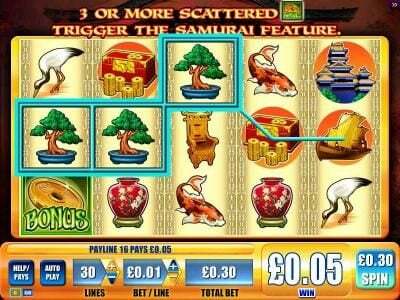 Included within this slot are a scatter symbols, free spins and wilds. The title of the slot doesn’t leave much of a mystery when it comes to the theme of this game. It’s about Japanese samurai and thanks to this theme the graphics focus on the culture of the country where these fighters are coming from, Japan. Most of the symbols used in the game actually don’t have that much in common with a samurai, and they’re mostly things that you might see in Japan. The graphics do have an Asian influence and they are well designed, with a Japanese temple visible behind the reels. The logo has two crossed swords in it, quite appropriate considering the theme. The symbols of the game have on the Japanese signs, samurai, temples, treasure chests, boats, thrones, pottery, Koi fish, birds, Bonsai trees and gold coins. The game requires the player to choose the number of lines he wants to place the bet on plus the coin value. Each line can get one coin when the bet is made, so depending on the number of lines selected you find out how many coins you’re going to use. The coins have values in the $0.01 to $5 range, with the bets going up to $150. There are payouts of up to 500 times the line bet in this game, with the jackpot being $2,500. The wild symbol is the one that’s usually most important in a game, but it’s not the case here. While the wild does have its important role of a substitute for other symbols, the scatter symbol seems to be doing a lot more for the player. The wild also doesn’t have any payouts of its own, so that’s another reason why we prefer the scatter. The reason why the scatter is the symbol that you should want to get as often as possible is the number of Free Spins which will be awarded by it. With three scatters the player gets 10 spins for free, while four scatters will award 25 spins. The truly big number comes with five scatter symbols, where the player gets 100 spins for free. You will find Samurai Master to be a great game, which seems to meet all the usual requirements in order to qualify as a good choice. The payouts might seem small, but keep in mind that you can get up to 100 spins for free while playing it.